"As our faith comes under fire – with today’s attack on religious liberty – we must remember that God uses fire to purify our faith. Fire draws a line in the sand: Are we in or out? With Him or against Him? There is no in between. We’ve heard some say, 'I’m just riding the fence, sitting quietly, waiting to see what happens.' To them we respond, 'The devil owns the fence. Choose which side you’re on, and jump to it. Besides, you can’t stand strong on top of a fence.' The Supreme Court’s ruling on gay 'marriage' made it painfully obvious that religious liberties, especially for Christians, are now in the cross-hairs of the militant, secular agenda that is fundamentally changing our country. This means we need to get off the fence and stand up. We’ve got to decide beforehand, i.e., today, what we’re going to do when our faith is actually under fire." 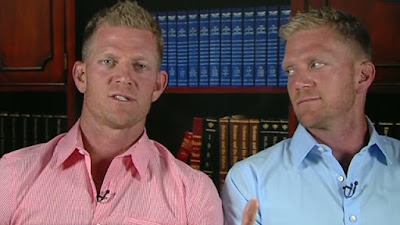 - Jason and David Benham, writing for World Net Daily.